Discussion in 'The Perfect Line and Other Riding Myths' started by D0N, Jan 28, 2011. I don't think this would work if you are dirtbag and were trying to title a stolen motorcycle. They're going to run the VIN and you're screwed if it comes up stolen. You just bought a legitimate motorcycle with no title or you've lost your title. You want to register (or sell) your motorcycle but you can't because you can't prove that you own it. We've probably all run into this problem in our lifetime. http://dmv.vermont.gov/help#VehicleRegistration It even tells you that you DO NOT need to be a resident of VT to register a vehicle there. Strange but true. You can register your bike thru the mail in VT. Print out the proper forms from the VT DMV website, fill them out and mail them in. It cost me $89 ($41 reg fee & $48 tax) to title and register a bike I bought in NY w/no title. This includes a VT license plate & a 1 year transferable registration. Your VT license plate and transferable registratgion takes about 10 days to arrive in your mail after you send the correct forms and check out to them. How do I know all this? Because I just received my new VT plate and transferable registration in the mail today! You can be sure that if you ever decide to sell your motorcycle without a title (or transferable registration), it's worth about 30-40% less and your pool of potential buyers drops by about 50%. Very interesting. I recently purchased a 50cc scooter with a mistake written on the title, so I couldn't transfer it to me...it then turned out that the guy I bought it from wasn't the original owner, but his nephew or something. This might just score me a title. This will work. It won't get you a "title" but it will get you a very similar "transferable registration" which you can surrender at your local DMV for a title (if they title small motorcycles in your state - many do not). I emailed www.its-titles.com and they wanted $255. That's what spurred me to try the Vermont route. Low and behold... it worked. The pool of available motorcycles for me just jumped a zillion percent. You acquire a bike with no title. Do this thing through VT and get a tag and registration. Take said registration to your local (not VT) DMV and they'll give you a title? Sounds too good to be true. If it IS true, though, I'm hitting up craigslist like it's my job. I have a bike with no title, I'm going to give this a shot. The bike obviously can't be stolen. You get a full years worth of VT registration too. Depending on your states laws regarding when an out of state vehicle needs to be registered in state... you can ride around completely legal in your state on the VT reg and plate. When you're ready to register it in your own state, you simply bring the transferable VT reg to your local DMV and register the cycle in your name. If your state titles smaller motorcycles, you'll get e new title in exchange for the VT reg. There's nothing illegal or wrong doing this. VT DMV is known for being easy to deal with. All states should be this easy really. Now that I know this works... I've got 1 more bike that I'm going to do this with. tuna let us know how it works out for you. Does a person have to be a resident of Vermont in order to register a vehicle in Vermont? 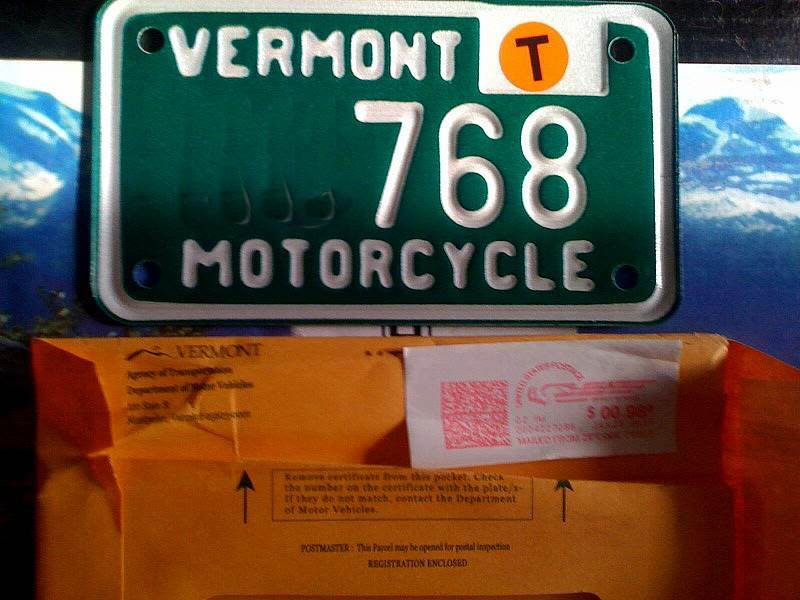 How do I register a motorcycle in Vermont when I purchased the motorcycle in another state? You must provide DMV with the following: a completed Registration Application form #TA-VD-119 ( 424.7KB), the bill of sale, the title to the motorcycle, an updated (current) odometer statement and payment of the proper fees. If you did not purchase the motorcycle from a dealer (if you purchased it from a private individual) you will also need a "Visual Verification of Serial Number" completed. If you had registered the motorcycle in another state you will also need proof of the amount of tax paid to the other state. ---> About the "Visual Verification of Serial Number" ... I didn't have to do that at all. I entered the VIN on the registration form but that was it. No 3rd party verification needed. It varies by state. But in MI in 1996 I got a bike out of barn. Went to DMV, they asked estimated value, cause I got it free and they wanted there money. They gave me a form, copy came by the house and verified the VIN #. Wasn't a big deal. The Vermont deal was well known a few years ago, but word was it got shut down. I guess that's not the case? Could be that I'm thinking about folks who used it as a way to title an off-road only bike for the street though. If you do that here in Nebraska now they will run the VIN and you are hosed if it comes up off road, regardless of what paperwork you have from another state. It kinda depends on who you get at the DMV though. Some of the rural counties are more lenient. The other thing I run into here in Nebraska - anything that doesn't actually have pedals on it is a motorcycle, regardless of displacement. So any 49cc scooter without pedals has to be registered/insured as a motorcycle and requires a motorcycle endorsement on your license. To be a "moped" it has to have pedals and be less than 50cc. You must provide DMV with the following: a completed Registration Application form #TA-VD-119 ( 424.7KB), the bill of sale, ***the title to the motorcycle***, an updated (current) odometer statement and payment of the proper fees. If you did not purchase the motorcycle from a dealer (if you purchased it from a private individual) you will also need a "
Sorry, I am confused. It seems that the quote mentioned that for registration of a vehicle purchased in another state, one needs to provide the title. Or course, that contradicts the hypothesis. What I am missing? I forget what it's called but if you don't have a title then you can still register an untitled vehicle. If, after 3 years, nobody has claimed the VIN then you can get a real title. I didn't need to send VT a title or have a VIN verification to register my bike there. That's all I'm saying. They're not going to cash your check unless they can register your bike. You have NOTHING to lose except the cost of a postage stamp and 20 minutes of your time filling out the forms. If you live here and purchase a vehicle then you're required to transfer title within 30 days. If I just paid for 12 months of registration in Vermont, I'd try to get as much use out of that as possible. Here in NY it's called a non-transferable registration. It allows you to register the bike and ride it on the road but you don't have proof of ownership if you wanted to sell the bike. It's pretty easy in Michigan. Just pick up papers from SOS/DMV, cops verify VIN, back to SOS/DMV and good to go. Every state has a different time limit... which you can ignore for a while. Sure, you'll get warnings from cops if/when you get pulled over but a ticket is doubtful because the bike is legally on the road. What ticket would they write you? Unregistered bike? Just don't get pulled over by the same cops a few times! They can write you up for not having transfered the title within thirty days which is a legal requirement. Just like they can write you up for having expired tabs. In Washington, you can be fined $25 on the 31st day(16th for in state title transfer) with $2 a day thereafter up to a maximum of $100. The way states & localities groveling for revenue these days you may or may not get a ticket. At the same time, it's a procedural thing, not a moving violation so even if you did get fined it still wouldn't hit your driving record. And I'll bet that you'd get hit here at the licensing office in Washington for the $100 fine when you wait a year to transfer title. My bikes cost about $50 a year to register so it's cheaper to transfer title on time. Since the max fine is $100 it might make sense to wait a year on more expensive vehicles. I always wait about 28 days to transfer out state titles. May as well get the "free" month, eh? In my case the guy gave me a written warning. My situation was a little different though. I was working in California at the time so the bike was down there for a while and I'd just ridden it home a couple of weeks prior. The CHP actively looks for vehicles with out of state plates and if you have a CA drivers license or the local PD has noticed you over a period of time on his/her beat, will ask you leading questions about the bikes status. I would love to hear from some of our better legal minds (or illegal as the case may be). Seems to me that if the bike has a current license from wherever and you just show them the papers and shut up, there isn't much to cite you for. I'm guessing the bike you registered was under 300cc or more than 15 years old? Still, if you have a bike newer than 1996 and over 300cc's... make out the forms and send it in. If they can't help you, they're not going to cash your check. You've got nothing to lose.